I should start off by saying that I don’t run. Ever. I grew up swimming in a gravity-free, turquoise 50-meter environment, and as a result, to say that I am inefficient on land is an understatement. 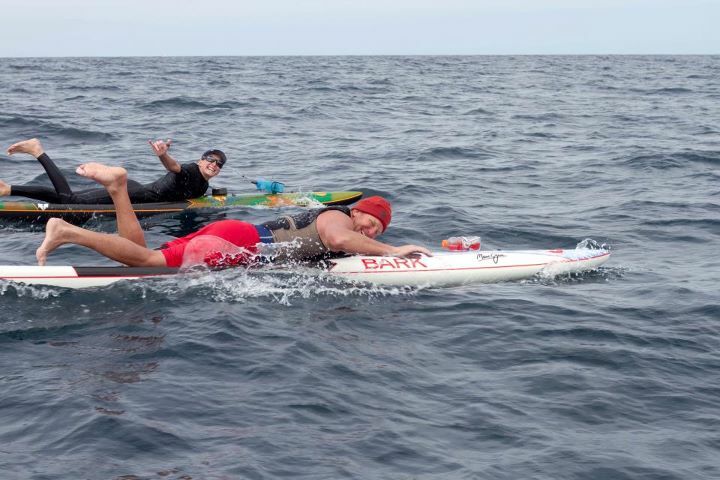 However, I am also a glutton for punishment and a sucker for a good challenge; so when Jack Bark (see video below), son of legendary paddleboard shaper Joe Bark suggested that we paddle 22 miles to Catalina Island, run the Catalina Marathon and then paddle the 22 miles back home again, I could hardly say no…even with the running part. Jack Bark Wants to Join Team Zico from Soul Surf Media on Vimeo. Because the BARK team is made up of a bunch of crazy people, I wasn’t the only one who agreed that this sounded like a good idea and on Friday, March 9, Joe and Jack Bark, John Becker, Dane Morrissey, Stephen “Reno” Caldwell, Nicole Madosik, Anders Jonsson, and I paddled away from San Pedro towards the Isthmus on Catalina Island. 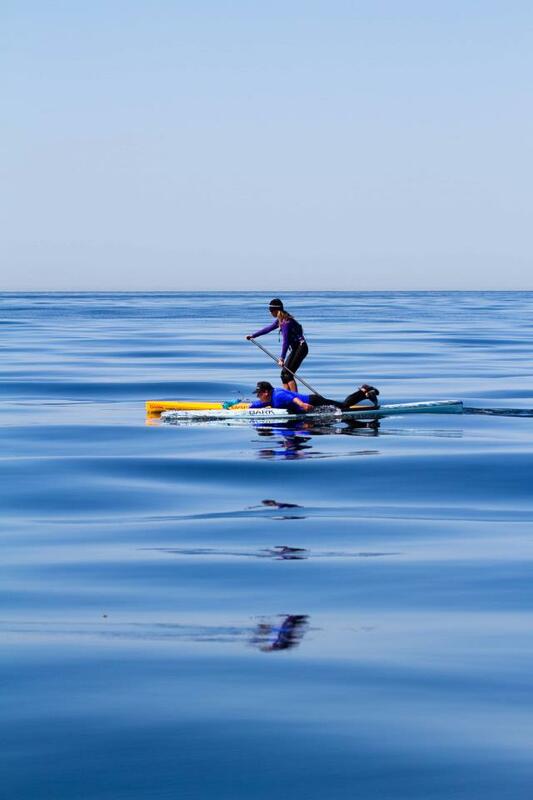 Escorted by Charlie and Chris Aguilar (who sacrificed paddling himself to film the trip), the paddle over was glassy and flat…ideal conditions for us since the wind usually favors paddling away from the island, not to it. 6 hours and 22 miles later we made it to the Isthmus where we were greeted by Theresa Hernandez McDowell who is quite possibly the nicest human on the planet. Theresa and her family made sure that we had places to stay and made us a pre-marathon dinner that even included a birthday cake for myself and Jo Ambrosi. Nicole and Reno, mid channel. 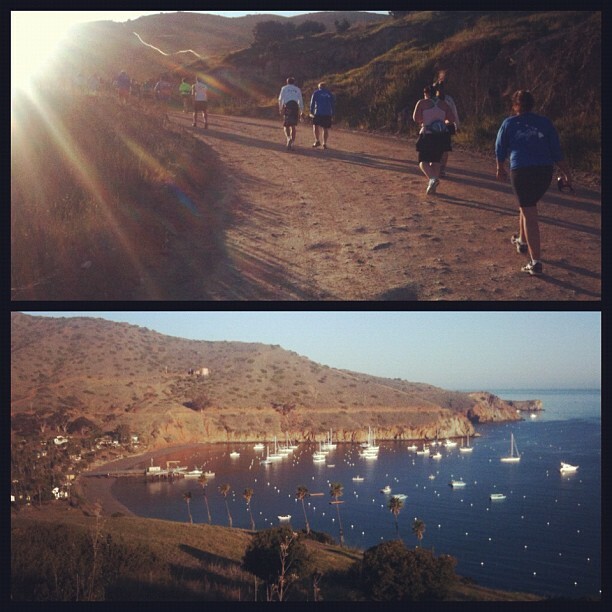 With Saturday morning came the Catalina Marathon, which turned out to be one of the more humbling experiences of my life. 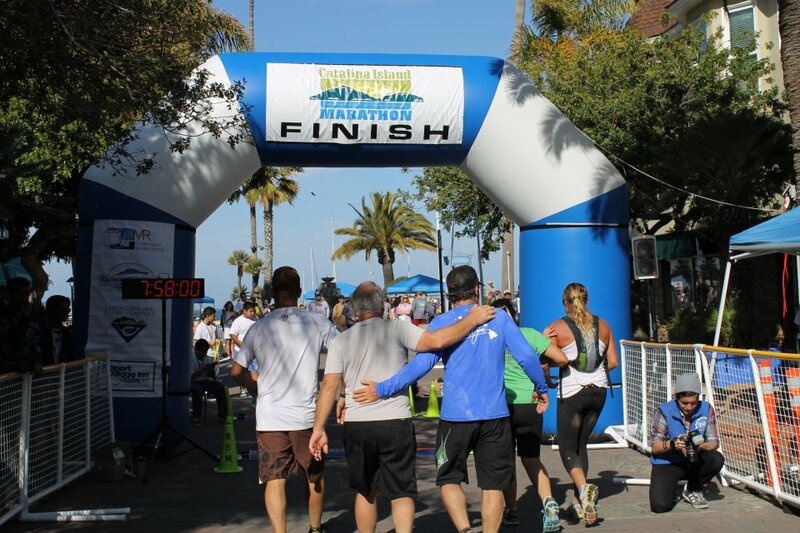 I knew that participating in a marathon would be difficult (especially since I was stubborn and didn’t bother to run at all prior to the event), but I had completely underestimated how challenging it would actually be. From the very start of the race, the majority of the team took off leaving behind what would later be known as the “final 5” (for obvious reasons). The final 5 consisted of myself, Reno, Chris Barrios, Lindsay Hutchins and Charlie, who was only a part of our slow group for moral support. To be honest, without those 4 other people, there was no way that I would have made it through the event. To Jack Bark from Morgan Hoesterey on Vimeo. 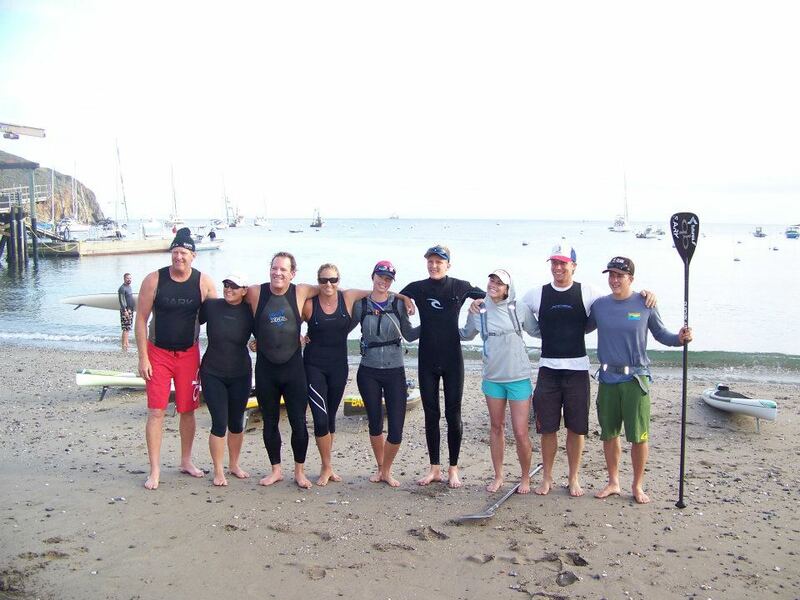 Sunday morning, we all hobbled down to the beach and prepared to paddle back to Palos Verdes. The 8 who paddled over were joined by Jo Ambrosi and Alison Riddle (who had both participated in the Marathon the day before) for the paddle home. I decided that I would trade in my standup paddleboard for a prone board for this one just to mix it up a bit and to stay off of my feet. I have never paddled that channel on a prone board before so I was anxious to see how it would go. The first few miles were great…the wind was at our back and there were even little runners leading us from the Isthmus past Ship Rock and out into the channel. A about 4 miles in however, the wind shifted south-easterly making the channel a bumpy, somewhat upwind challenge. Mid-channel we had to take a break to let a tanker pass, at which point all of us prone paddlers started to freeze a bit. 58 degree water is pretty cold when you are just sitting there. Everyone managed to stay in a pretty good mood for the most part; it was hard not to smile when you look over at Joe and Jack who both had perma-grins across their faces. Jack and Joe smiling their way across the channel. Five and a half hours and 22 more miles after we left the beach, we arrived at Terrenea. We were met by Cabrillo Baywatch who welcomed us in to the beach with their water hose. Nicole Madosik (who had remained dry the whole way across) ended up taking the water to the face which is what she gets for having the audacity to stay dry and warm all the way across. At the beach we were met with Joe and Charlie’s friends and family and a few giant buckets of KFC. For those of you who know me well, you know how much I love KFC and what that gesture meant to me =). This weekend was full of moments…moments that were really fun, moments that were almost too much to handle, and moments that I will never forget. As challenging as the marathon was, I don’t regret doing it at all and appreciate the time I was given to spend with the Bark team. The only question now is, what’s next guys?!? (and “the 50” is not an acceptable answer to that question). Thanks to Joe Bark and Maui Jim Sunglasses for making this adventure possible. You used my pic. This made my day! Bernadette, I love that picture! Morgan, I loved the post. You and the Bark team adventures are so much fun to follow. I am always inspired by the strength and mental toughness you have on these long rides… haha and now long runs. The coffee break and video was a nice touch at mile 20… Just staying loose and keeping the day fun. Loved it. Happy St. Patrick’s Day! Don’t forget to have a Guinness today. Maybe even a Irish Carbomb. right on mister Matthew! I miss you. I will call you soon, I promise!